Download "M.A. EDUCATION M.A. DEVELOPMENT M.A. 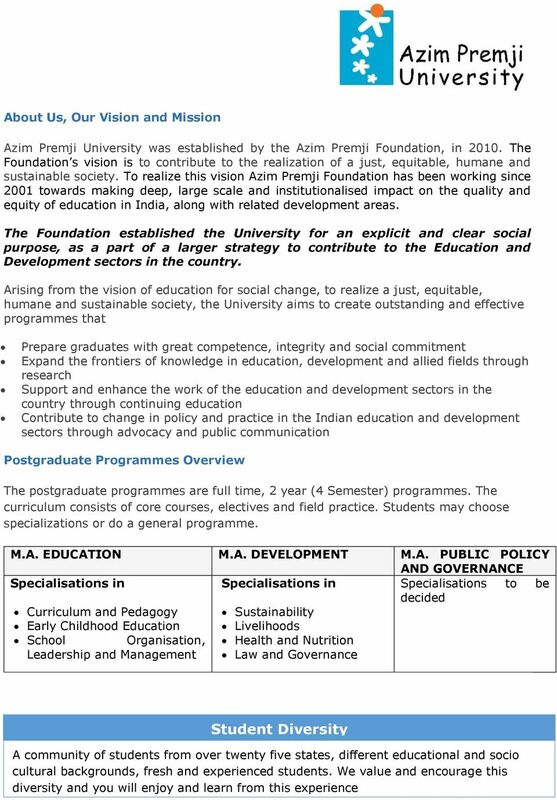 PUBLIC POLICY AND GOVERNANCE Specialisations in. Specialisations in"
3 SEMESTER I SEMESTER II SEMESTER III SEMESTER IV Philosophy of Education Sociology of Education Child Development and Learning Education Policy and School Systems Comparative History of Education Philosophy of Education Child Development and Learning Introduction to Education Research Curriculum Studies Political Economy of Education Elective 1 Elective 2 Elective 3 Elective 4 Elective 5 Elective 6 Elective 7 Elective 8 OR Option of Independent Study Open Course 1 Open Course 2 Field Immersion (2 Credits) Research (2 Credits) Field Project (6 Credits) Core Courses: The core courses will introduce students to key issues in educational thinking and practice. Courses are designed to help students understand education in general as well as in a large democratic, multi-ethnic, multi-lingual and multi-religious society. The idea is to introduce students to issues, problems, key ideas of investigation in each area of study. These courses are mandatory for all students and are 3 or 4 credit ones. Electives: The elective courses are designed to build knowledge bases theoretical, practical or procedural -- in particular areas of education. They are meant to supplement and extend understanding acquired in the core areas through deeper engagement with specific aspects of educational theory and practice. Typically, electives are on offer each year. 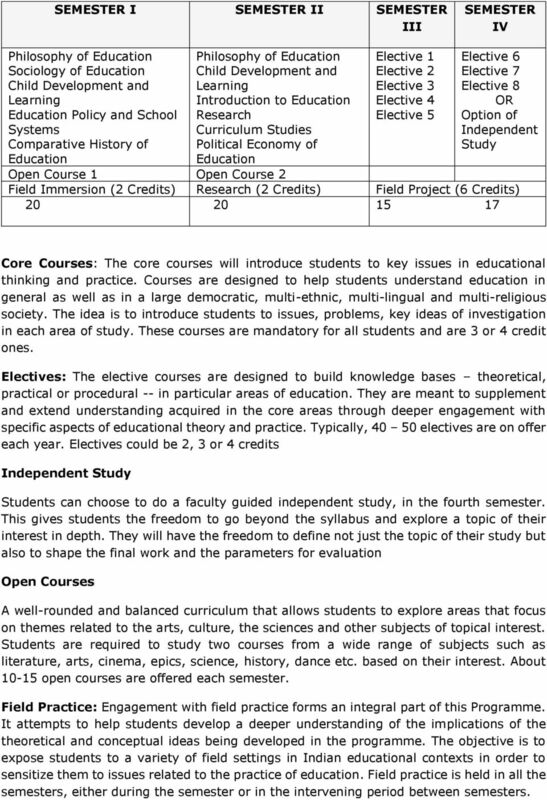 Electives could be 2, 3 or 4 credits Independent Study Students can choose to do a faculty guided independent study, in the fourth semester. This gives students the freedom to go beyond the syllabus and explore a topic of their interest in depth. They will have the freedom to define not just the topic of their study but also to shape the final work and the parameters for evaluation Open Courses A well-rounded and balanced curriculum that allows students to explore areas that focus on themes related to the arts, culture, the sciences and other subjects of topical interest. Students are required to study two courses from a wide range of subjects such as literature, arts, cinema, epics, science, history, dance etc. based on their interest. About open courses are offered each semester. Field Practice: Engagement with field practice forms an integral part of this Programme. It attempts to help students develop a deeper understanding of the implications of the theoretical and conceptual ideas being developed in the programme. The objective is to expose students to a variety of field settings in Indian educational contexts in order to sensitize them to issues related to the practice of education. Field practice is held in all the semesters, either during the semester or in the intervening period between semesters. 4 Type Weekly Practicums One Day per week Field Immersion, SEM I, Two Weeks Research Project SEM II Two Weeks Independent Field Project SEM III and IV Six Weeks Short Description Practicums are field experiences comprising an organized set of activities outside the classroom with the aim of embedding theoretical learning in practical experiences. 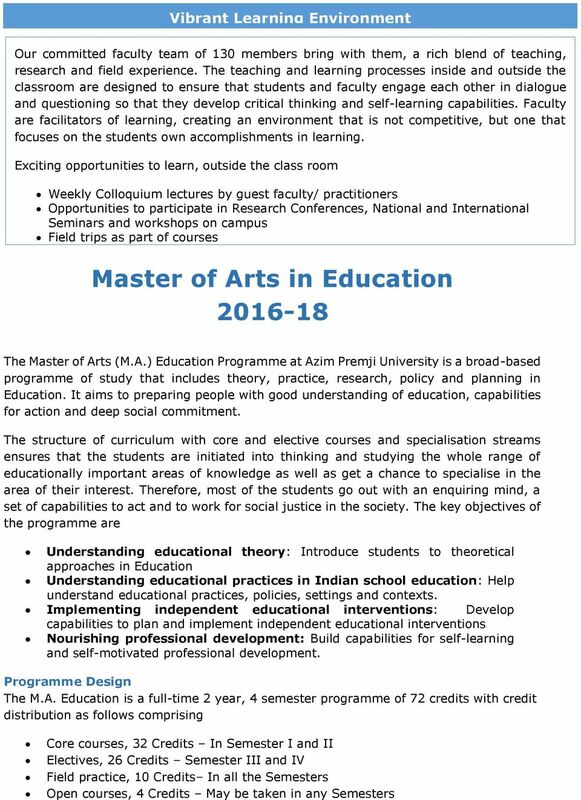 They run in parallel with the courses and students learn to conceptualize, plan and implement, critically examine some of the practices in various institutions. They also learn to work in groups. The key objective of the first semester field engagement is to provide students with exposure to different levels of the government education system and to offer first-hand experience. They will be provided with a variety of alternatives in terms of levels and contexts of exposure to the different structures, processes and activities that are important parts of the education system. The primary objective is to provide students a chance to work independently on a research project. They will be in field settings, conducting and recording observations and interviews, to complete a small, supervised research project. All phases of the research project from conceptualization to implementation, analysis and writing will be completed through guidance received through the Introduction to Education Research course. This is aimed at providing students a focused opportunity to work on a specific issue/problem related to the practice of education. The work will develop capacities in students in all phases of a project from reading and planning, to implementation, analysis and reflection, and oral as well as written reporting. 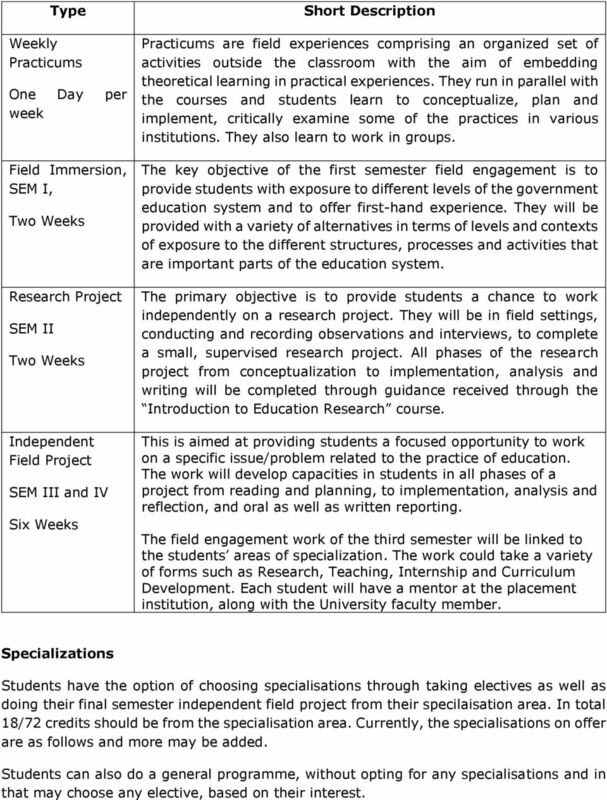 The field engagement work of the third semester will be linked to the students areas of specialization. The work could take a variety of forms such as Research, Teaching, Internship and Curriculum Development. Each student will have a mentor at the placement institution, along with the University faculty member. Specializations Students have the option of choosing specialisations through taking electives as well as doing their final semester independent field project from their specilaisation area. In total 18/72 credits should be from the specialisation area. Currently, the specialisations on offer are as follows and more may be added. Students can also do a general programme, without opting for any specialisations and in that may choose any elective, based on their interest. 6 Student Support We are committed to student learning, wellbeing and care. We provide extensive student support to ensure that students engage with the program fully and are able to realise their potential. A comprehensive set of support initiatives are offered on campus Academic Support: Language support, reading and writing classes, tutorials, dedicated faculty contact hours and workshops covering a range of support needs Personal Wellbeing: Counselling and Medical services, Self-Development programmes etc. Financial Support We provide extensive financial support for deserving students. 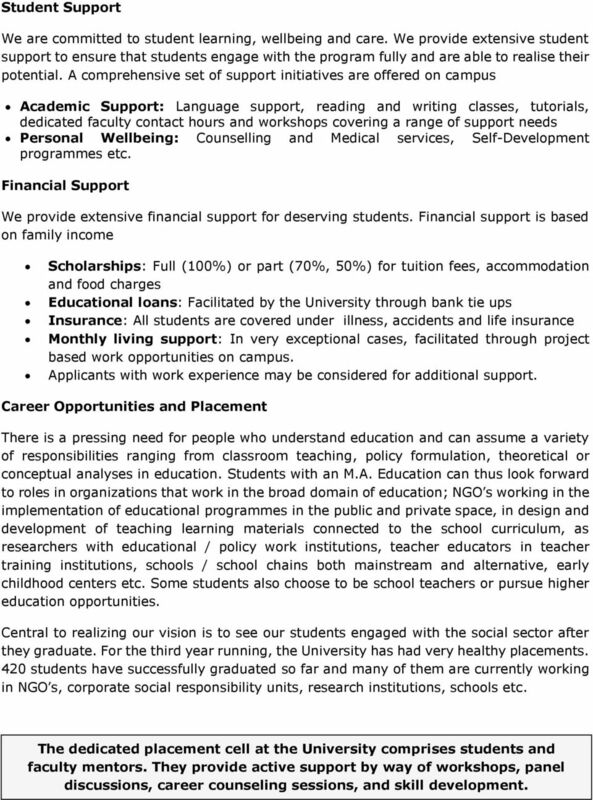 Financial support is based on family income Scholarships: Full (100%) or part (70%, 50%) for tuition fees, accommodation and food charges Educational loans: Facilitated by the University through bank tie ups Insurance: All students are covered under illness, accidents and life insurance Monthly living support: In very exceptional cases, facilitated through project based work opportunities on campus. Applicants with work experience may be considered for additional support. 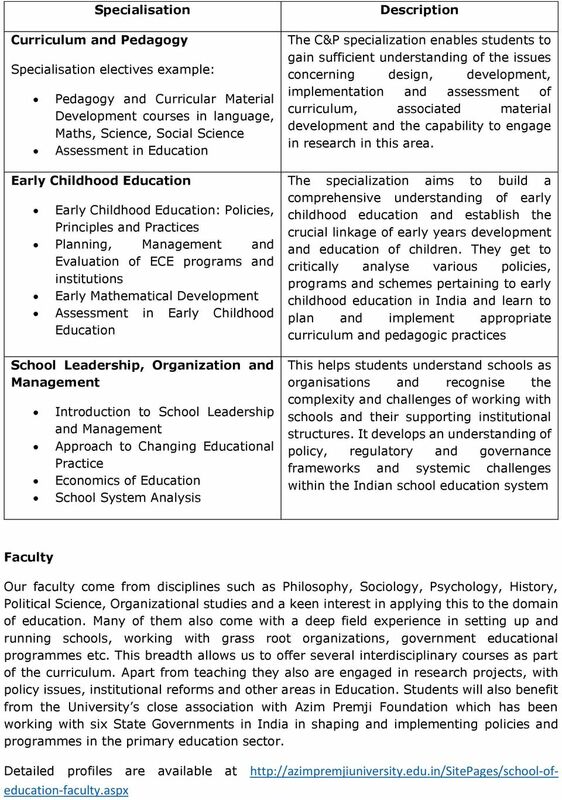 Career Opportunities and Placement There is a pressing need for people who understand education and can assume a variety of responsibilities ranging from classroom teaching, policy formulation, theoretical or conceptual analyses in education. Students with an M.A. Education can thus look forward to roles in organizations that work in the broad domain of education; NGO s working in the implementation of educational programmes in the public and private space, in design and development of teaching learning materials connected to the school curriculum, as researchers with educational / policy work institutions, teacher educators in teacher training institutions, schools / school chains both mainstream and alternative, early childhood centers etc. Some students also choose to be school teachers or pursue higher education opportunities. Central to realizing our vision is to see our students engaged with the social sector after they graduate. For the third year running, the University has had very healthy placements. 420 students have successfully graduated so far and many of them are currently working in NGO s, corporate social responsibility units, research institutions, schools etc. 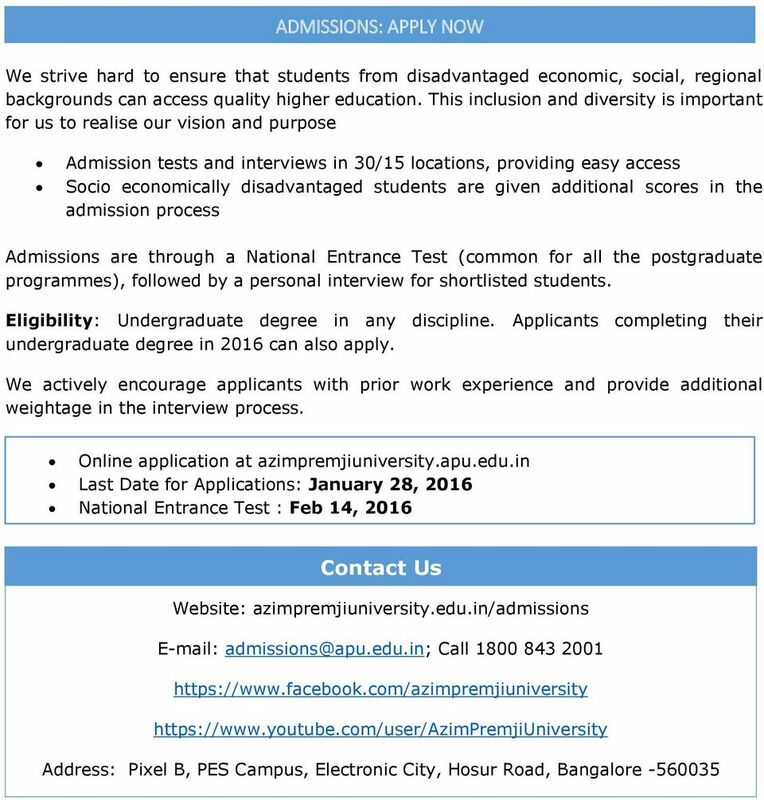 The dedicated placement cell at the University comprises students and faculty mentors. They provide active support by way of workshops, panel discussions, career counseling sessions, and skill development.